not only did i polish the script to specification but I made some nifty artwork for conceptualizations sake. the first is of the opening scene where the ship accelerates into the planet’s atmosphere, and the second is the main character navigating the hallways of the mining facility. I don’t think any artwork was essential for this module,but a crapton of storyboarding and concept art surely wont hurt my grade. hopefully the *ahem* inspirations from metroid and alien aren’t too apparent,tried to differentiate myself enough. The camera fades into focus from black. A wide shot of a red planet is taking up half the shot. 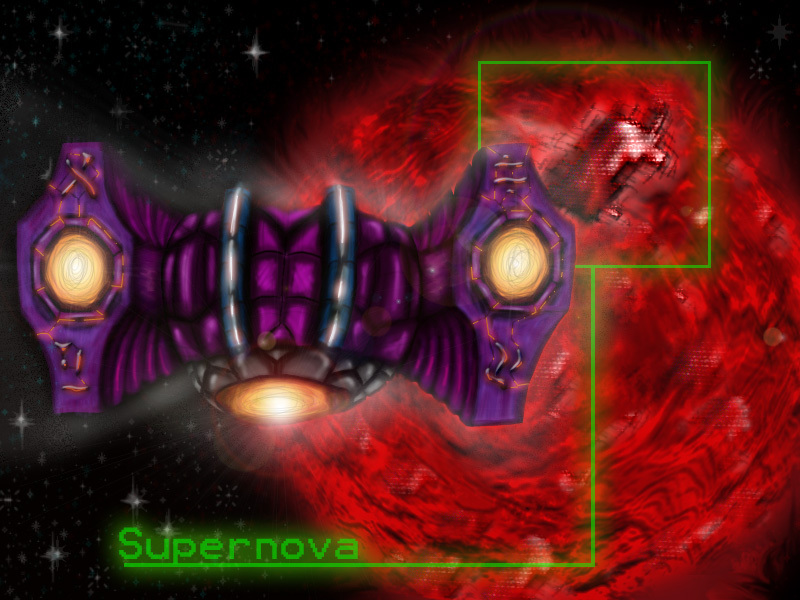 An unusual spaceship appears in the foreground, it is very blocky shaped and has a bright color palette, with many runic etchings across its helm. It travels towards the planet fading in its red aura. Seemingly deserted with no active machinery or lights. The building is devoid of much color save for grays and some red ash near the base and is comprised of hard angles and scratched, rusted metal. In very bulky armor stepping out. She takes a second to look around and then steps towards the inoperative cargo doors. She slides her hand in the gap in the middle and peeks her head through and glances at the desolate hallway before stepping in. She enters into the building and walks down an unlit hallway Littered with debris and signs of a struggle. Claw marks Adorn the walls as do bullet holes and various broken piping are spitting out steam at irregular intervals. 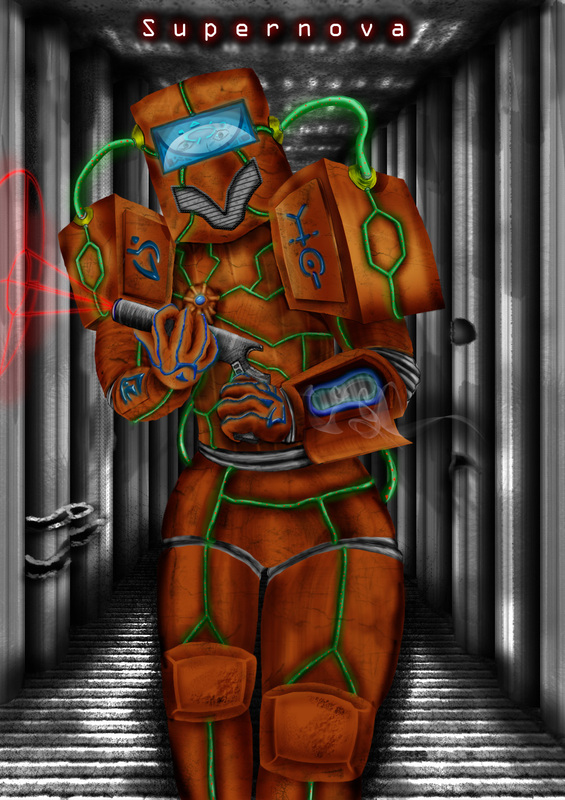 As she walks further ahead she passes a door with various biohazard warnings on it. As soon as she does there is a muffled scream heard from the other side. She takes a step towards the door, and as she does it bursts Open and a man wearing a blood stained lab coat leaps out. Oh god shut the door! PROTAGONIST before scuttling rapidly towards the door. Arm of the PROTAGONISTS suit. She arms herself with it quickly and shoots the alien with a plasma burst causing it to stop in its tracks mere meters from the door and explode in a gooey mess. With the alien dead the camera quickly transitions to black. Little remains of the alien, only a glowing stain where it once stood. The SCIENTIST, a weedy man with blood dripping down from his Head then calms down and catches his breath. He stands up and wipes the mess from his forehead before talking. Where is the control room? They walk down an innocuous hallway leading to the control room. The SCIENTIST looking at the PROTAGONISTS armor in a puzzled fashion every now and then. There are various quick shots of the details on the suit, such as the foreign alien symbols, hatches and holsters for unknown objects and the lights on the helmet moving by them scanning random blood stains on the floor. Footsteps echoing over the silence. Once they reach the control room she moves towards the window over by the console and places her hand on the glass staring at a cave entrance deep down on the planet’s surface. It is obviously the area she is looking for as there is a lot of mining equipment close to it and various piping and cables leading to inside it. Walkways and slides it open. Fine just, just PLEASE HURRY. Use of thrusters on the base of her boots. Have giant claw marks on their backs and look as if they were trying to get away from the cave. Automatically emits from her helmet. Her feet squelch against the soft, wet floor of the cavern. Leads her to an altar with an ominous turquoise light glowing from its ridges and cracks. Scanning beam comes from her chest and reads the altar. Stops glowing and the caverns begin to shake violently. Wasting no time the PROTAGONIST makes a hasty escape using the thrusters on her boots to run at high speeds. beams are caving inwards and fragments of metal are falling off the structure. Still on the move she sprints past all the objects falling around her as she makes a running jump for the walkway leading to the control room. She leaps about half of the distance needed and then flames emit from the boosters on the soles of her boots and propel her closer to the walkway, she only just manages to grab on and get indoors before a large section of wall plummets from above and tears the entire walkway off the side. Spots him slumped in a corner. She runs up to the body. As Soon as she approaches him she see’s the claw marks all over His lab coat and his blood flowing onto the floor and down the ventilation grates. a HUGE THUD! Then makes the entire room tilts on its axis. Knocking her to the ground closer to the dead body. She moves her head upwards as she rises from the floor and catches a glimpse of the SCIENTIST`s frozen, horrified expression. Along the hallway she spots 3 aliens. They Turn around and spot her too and let out a ferocious roar. They spit acid in her direction. Equips the gun from her arm hatch once again and starts firing at the aliens up ahead. She manages to hit one causing it to explode but the other two leap up and latch onto the Ceiling. Along the floor aiming her gun upwards at the pair of aliens. She fires upwards managing to take down one of them. Feet and sprints down the hallway at full speed as the camera watches her go into the distance. Still in the previous hallway the surviving alien drops down onto the floor and lets out a distinctive roar from earlier, one which isn’t as aggressive sounding. A few moments afterwards aliens appear from all the vents and doors in the hallway to give chase down the tunnel after the PROTAGONIST. She faces forward again and as she sprints down the hallway she notices a monitor on a pivot attached to the ceiling. It is displaying the number ten in that planets native language. Just as she runs underneath it a glob of alien spit is shot from behind her and knocks the monitor off and it almost falls on top of her. The door in sight she runs even faster. Her thrusters emit flames and she shoulder rams the helipad doors with enough speed and power to knock them off their hinges. And they rise back into the ship when she is inside. Start spewing acid all over it. Buttons on the command console as the ship slowly rises into the air. The aliens still spewing on the windscreen don’t stay on for long as the ship picks up speed. Into the ground as explosions engulf the base and the aliens leap in the air in a hopeless attempt to latch onto the ship. The camera pans behind the ship as a sudden blue flash comes from the engine and the ship zooms off into orbit. The faint cries of aliens are heard as the facility is completely swallowed by the flames of the explosion caused by the self destruct. The PROTAGONIST is in the driver’s seat with her hands gripped tightly on the controllers. the ship slows down to a slow drift and she lets out a big sigh and leans back and rests her arms on the side of the chair. The camera then cuts to a view of behind the chair as metallic shuffling can be heard. Her helmet is removed and placed on the terminal to the side. Hair and an aged, scarred face. A beam of light emits out from her chest armor in a holographic stream to the console monitor. She looks on with a look of surprise at her suit acting on it`s own once again. Once the stream fades, a series of foreign symbols appear onscreen. Then an image of a snow laden planet appears. Well I guess a colder planet will be a nice change of pace. Space as it watches the ship fly out into the horizon as the scene fades to black.